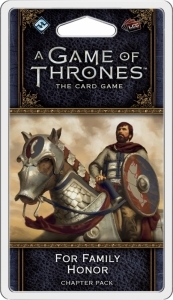 A Game of Thrones: The Card Game – For Family Honor is an upcoming Chapter Pack in the "War of Five Kings" cycle that continues to follow the storyline of A Clash of Kings. Throughout this Chapter Pack, you'll find plenty of new cards that support the major themes of the cycle. New Kings and Crowns invite you to stake your own claim to the Iron Throne, even as other cards heighten the importance of loyal cards: the characters you can truly trust, the locations that would never fall, the events and tactics that you utterly control. Finally, For Family Honor introduces iconic characters to join the game, including Ser Edmure Tully, a House Tyrell version of Renly Baratheon, and Hot Pie.